The Air Jordan 11 “72-10″ has cause nothing but mayhem in the sneaker community. The crazy thing is, the sneaker doesn't actually hit retailers until December. The plethora of detailed photos of this year's Holiday release have been teasing us for months now. Coming to retailers in celebration of Jordan Brand's 30th anniversary, this colorway of the Air Jordan 11 is inspired by the '95-'96 Chicago Bull's amazing season record. 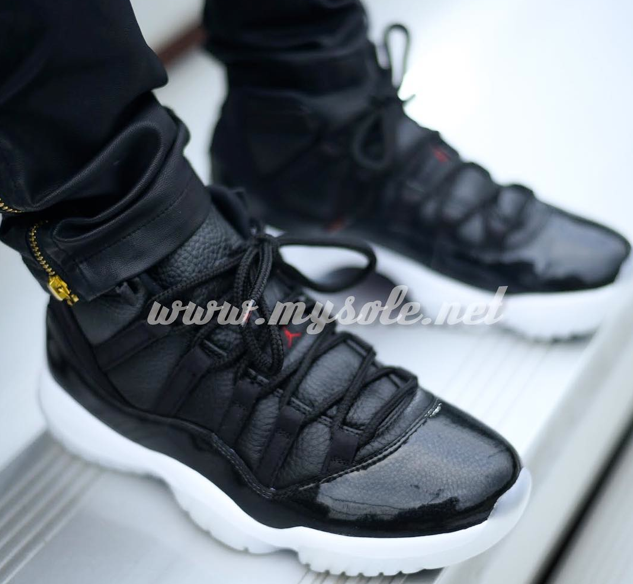 The Air Jordan 11 “72-10″ is comprised of a fully black leather upper with white on the bottoms. Tumbled and Patent leather make up the sneaker's upper while the midsole and outsole are its usual selves. Complete with plenty of popping red hits, the Air Jordan 11 “72-10″ is going to be a very popular release. Scheduled to release December 19th, let us know if you planning on copping a pair below.